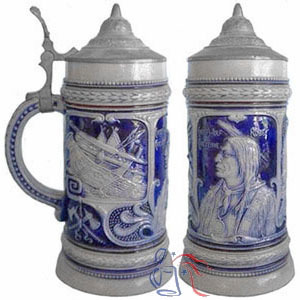 This series of steins honors 19th century American Indian tribal leaders. 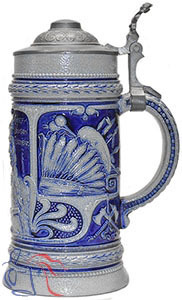 All bear the same model number and are otherwise identical except for the central images, which are drawn from photographs taken by Frank A. Rinehart (1861-1928) at the Indian Congress held in 1898 in conjunction with the Trans-Mississippi and International Exposition. Pictured examples include: Chief Louison, Flatheads (right); Chief Wolf Robe, Cheyenne (below left); and Chief Hollow Horn Bear, Sioux (below center). See also Nos. 025 and 027.